This quaint 52-room hideaway, surrounded by tropical gardens and just steps from the Hip Strip may be the smallest Sandals but it's big on charm and huge on value-with an impressive array of amenities for its size. The cozy bed & breakfast ambience of this traditional Jamaican inn is warm and captivating. In a place where everyone knows your name, the famously attentive staff also happens to deliver 24-hour complimentary room service to all guests, assuring breakfast in bed can be a favorite any time of day. 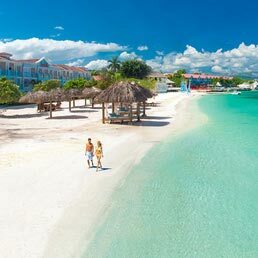 Best of all, your Luxury Included® Vacation also includes exclusive "dine and play" privileges at two nearby Sandals Resorts. This 52-room hideaway, surrounded by tropical gardens and across the street from a public white-sand beach, is small in size but big on charm. All rooms feature 24-hour complimentary room service and many feature views of the ocean, pool or garden. With our exclusive Play at 3 Program, you can expand your options to dine and play at two additional resorts. Complimentary round-trip transfers between all resorts are part of the Sandals Luxury Included® difference. Enjoy 3 restaurants on property and an additional 20 restaurants at nearby Sandals. 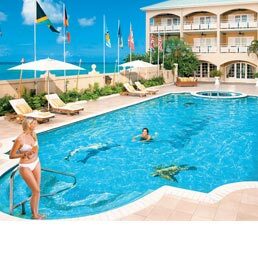 From the garden-side grilled treats at Nibbles to the international delights at Bay Window Restaurant to the classic French cuisine at Carlyle Restaurant - the exquisitely-prepared meals at Sandals Inn are sure to please any palate. We have designed the bars exactly where they should be – right on the beach and directly over the ocean – to give you a truly authentic island experience. We’ve even created bars inside of our beachfront pools. Grown in Jamaica's misty Blue Mountain range, Jamaica Blue Mountain's Blend coffee possesses an unmatched superior flavor and it's included throughout all our specialty restaurants, French-style cafés, lounges, self-serve coffee stations, and indulging room service. From chic gatherings to exciting shows, themed parties and events, there are endless ways to be entertained day and night. 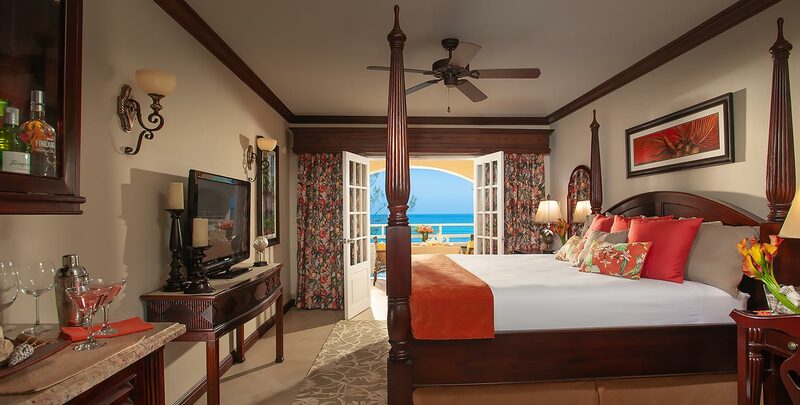 The rooms at Sandals Inn overlook the gorgeous pool and the ocean just beyond. 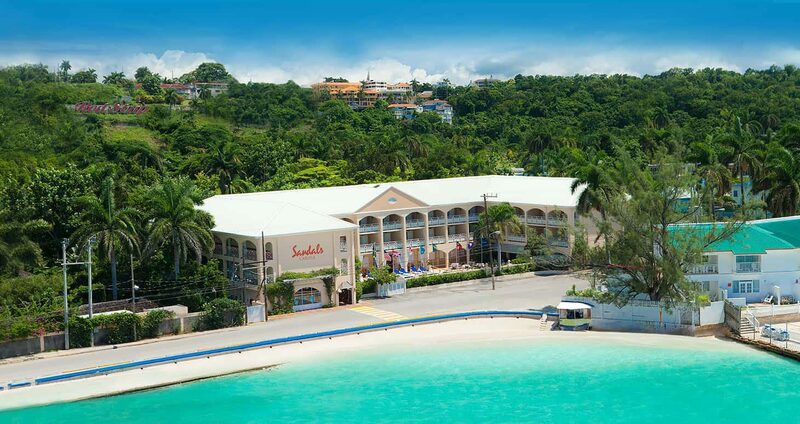 Surrounded by comfortable lounge chairs and umbrellas, the Sandals Inn pool is the perfect spot to relax, take a refreshing dip, or soak up some sun. The setting is charming, the staff genuinely caring, and at this intimate seaside inn, every luxury is included - even 24-hour room service, where breakfast in bed is a favorite any time of day. Indulge in a romantic dinner in your room, or arrange for a midday nibble. From the moment you arrive we start taking care of you. Relax and enjoy your stress-free ride with non-stop airport resort transfers featuring air-conditioning and comfortable, spacious seating. Or, opt to arrive in style in a private luxury vehicle from our first-class fleet, which is available for an additional cost. The best way to experience Jamaica in full is to get up close and personal with it. Island Routes excursions are led by people born and bred on the island, and they can't wait to share all the best spots and most exciting adventures with you! Nestled across the street from a public white-sand beach, this 52-room hideaway is surrounded by tropical gardens. With 3 restaurants offering tantalizing temptations, every meal becomes the most delicious part of your day. Impeccable service, exquisitely-prepared international cuisine, and a romantic ambience make every dining experience absolutely extraordinary.